Marvel is pairing up with the Autonomy Aurasma platform to bring augmented reality (AR) extras to comics. The announcement, made at SXSW, means that users will be able to watch video trailers, animations, recaps and other AR treats by holding up their phones to comics. The new AR-equipped Marvel app will be free to iOS and Android users, and forms part of the Marvel ReEvolution brand refresh. "Marvel Infinite Comics" written specifically for digital distribution are also in production. 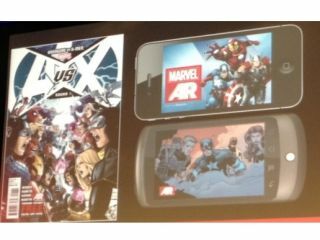 Marvel explained that these will be "the first Marvel comics built strictly for digital. They'll use parameters of your iPhone or iPad. It's a new canvas for storytelling." It then went on to say that the aim is to "build out DVD and Blu-Ray extras into the comic book itself." This means that regardless of whether you buy a print or digital version, you'll still get a plethora of interactive features and extra content. Avengers Vs. X-Men will be the first to get the AR treatment later this year. You can check out the SXSW Iron Man cover demo on YouTube.